Freshly harvested or cut wood is only raw material, that becomes valuable construction material only when most of the dampness is removed from it, i.e. after drying it. Wood has to be dried until so-called equilibrium dampness, compatible with its maintaining conditions. These conditions are described by air parameters (temperature and relative humidity), therefore humidity to which the wood has to be dried, depends on the purpose of the wood: wood used to make furniture has to be dried up to 7-8% humidity, wood used for construction materials up to 18-20% and so on. Products and constructions, made out of non-dried or poorly dried wood are inferior, because while maintaining it in dry environment it changes its measurements, their joints crack, and in humid environment wood can be attacked by coloring mold, and later on by wood-destroying fungi. Fungus proliferates in wood, when woods temperature is between -50°C and +50°C, and its dampness is higher than 22-23%. 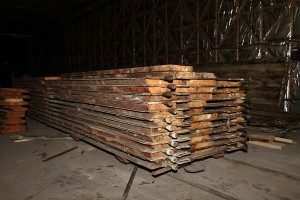 Therefore, from a long time ago construction wood used to be dried: from the oldest times only by natural atmospheric way, later on atmospheric and artificial way – in special drying rooms at natural and then forced air circulation. Convectional drying is a process, when by heat treatment humidity is evaporated from a material, and when the steam is removed. When material is drying moisture diffuses from the inner layers to the surface and then evaporates to the environment. During convective drying material is dried in warm air or smoke flow. Drying agent transfers part of its heat to the material and removes evaporated water steam from it. Drying by this method, for drying agent, heated in the heater or fireplace, additional heat is supplied in work chamber. 2. 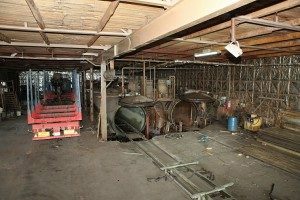 Trolley are pushed into mentioned autoclave. 3. Electrodes are drilled into a plank to control humidity. 4. Plates are linked with fast connections, which will be used to feed the plates with hot water. 6. With the help of vacuum pump air is sucked out until 0,8 bar. 7. Drying started. 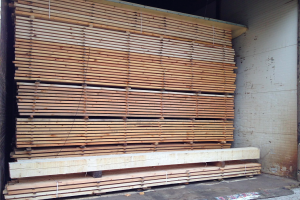 Drying time depends on the thickness of the planks and on the type of wood.